Enjoyed the build photos of Blow Fish, Geoff. What are your cruising plans for her? She seems like a capable little boat. Local friend built a& 15ft gaffer cutter. Strip followed by two layers of veneer and glass epoxy sheathed. First time build, though he had basic wood carpentry skills. Prob cutting out the veneers and adding a bit more glass would have saved a bunch of time. Strip makes it easy to get the shape true on fewer moulds, while cold requires more moulds and relatively closed spaces ribbands, so nearly a complete male mould. To be honest I don't know, but during the build I kept in mind the possibility of being at sea for longish periods of time in a range of conditions. Little by little I will find out what she can handle. When some cruises have actually been completed I will be able to answer. My way of looking at this subject is sort of from the other perspective. Rather than picking a boat design I like and trying to make it fit, I'd analyse the needs and then start looking for qualifying boats. What sort of voyaging will you do? Short hops of less than a week? Trans- ocean 20 - 40 or more? How much weight allowance will you need for consumables, food, water and fuel. how much for equipment and spares, and personal effects? might you have more than one person on board? The boat needs to have sufficient stability. Most folks now figure the AVS (Angle of Vanishing Stability) should be beyond 130 degrees. Certainly the boat you choose should have a substantial righting lever at 90+ degree ( mast in the water knockdown). I like stiffer...for sail carrying, though that is possible at the expense of motion comfort. the boat you choose must be sufficiently watertight...keep the water out. Several pumps for removing water that gets in. It should be built and outfitted for the voyage. I like two masts, but in a smaller boat I might opt for a single mast. I would prefer a shorter rig than we normally see with a standard marconi sloop/cutter. I would probably choose a gaff rig, but a lot of small offshore sailors choose a junk rig. Again the shorter rig helps with sail carrying. I didn't think many people still built pure cold-molded hulls. Stripping it first saves a lot of labor,fewer moulds, no ribbands, fewer veneers. I haven't seen anyone mention the Nordic Folkboat on this thread. Is there a reason why anyone thinks it wouldn't be a good bluewater pocket cruiser if it has a self-bailing cockpit? I've picked that design because of its low displacement and its reported seaworthiness and reports of folks making ocean crossing voyages in it. And, so that I could either tow it to different locations or use as a seaworthy single-handed cruiser in waters along the east and west coast lines of North America. Folkboats quite often cross oceans. Blondie Hasler's Jester was a Folkboat seriously modified in deck and rig. Post-WWII was a great time for small ocean going yachts like Folkboats, Vertues, and the phenomenon of MORC racing. It had been thought that small boats were unsafe at sea, but in reality they are easily made safer than larger boats because stresses on rig and hull increase with displacement. A fifty foot 20 ton boat should have an easier motion and be much faster than a less than one ton 25 foot boat, but if rolled is far more likely to lose her rig or if swept by a sea can easily suffer deck house damage. The smaller boat just goes with the flow. The problems with a smaller boat revolve more around increased voyage time versus ability to carry supplies, and the general fatigue of bouncing around so much. 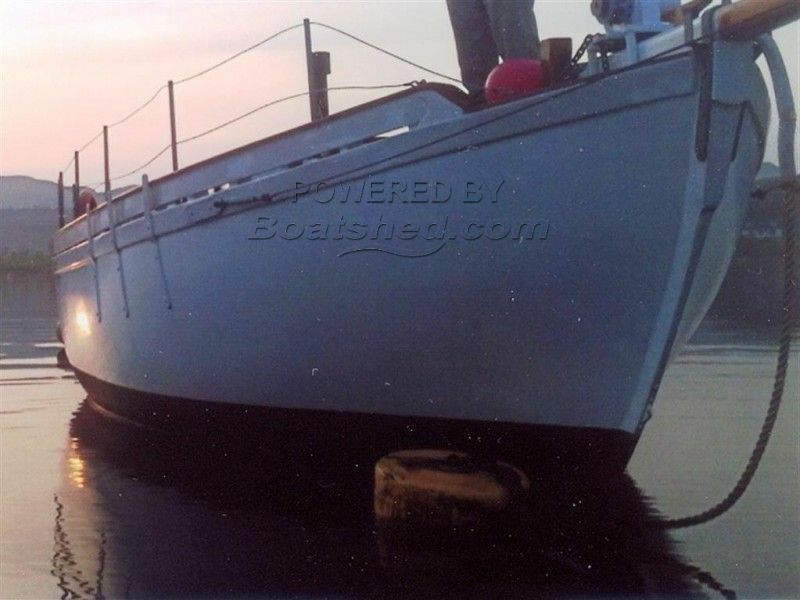 Folkboats are good, no question, owned one myself for some years, but the original post seems to be looking for something a little smaller "20' to 24'". Having said that, my 17.25' Blow Fish to the design of Perigee is about 1.9 tons cruising displacement. Folkboats are 2.4tons (or there abouts). Length is not a great measure of size. I second Ian's comments on the advantages and disadvantages of small (not to suggest big boats are bad, I love them too). The displacement on a given length i touched on earlier, a boat with the same weight but a waterline 4ft longer is a big difference in daily runs, and both are still small enough that in crap weather both will still be uncomfortable. Horses for courses though, you might have a real need to have a cut off length, in which case it might be a good idea to make it as burdsome as you can afford. Just as an example Roger Taylor moved on from his Corribee 21 with a 15ft waterline, to his Achillees 24, which he says gives him an extra voyaging range of 1000 miles over his "usual" 3 month period with that extra 4ft. Could make the difference between being stuck in the Fiji Islands during the cyclone season or safely down in New Zealand. I agree about length in terms of the boat as pure sailing machine, more length sails better. I find comfort is better the heavier the boat. I've been sea sick many times on my folkboat and found the motion violent at times. By comparison the vertue, of similar length, but far greater displacement I found to have a docile motion which was quite comfortable and not sickening (not to me anyway, but everyone is different). So for comfort heavy is good, but this may exceed the best displacement for pure sailing performance. It's a balancing act. ^ Totally agree, and some peoples priorities will be different. I found the Rival (plastic) range to be one of those compromise boats that work, not a full long keeled but not a fin either, not extreme in displacement nor lightweight, and the right amount of sail to keep it going. One of those "middle of the road" designs that work well. Loading up with 40 days worth of stores and water on a small boat can put things into perspective, and hefty little yachts like your "blowfish" can handle that better than some. Bruce is right in what he said earlier. In the moderately distant past it was pretty normal for small pocket cruisers to take on long voyages. These days the smallest boat I know of in my circle of friends is a Vancouver 27, the rest are high 30's to mid 40's. I think Roger Taylor in Ming Ming and Ming Ming II is perhaps the best source of good current information. It is worth repeating here that though he gets pretty much a thousand more miles in his 40 odd days, it is still an exceptional day he sails more than 100nm.. Sailing is its own reward....Sailing is a pretty stupid way to travel. Ultimately it is cheaper, easier, more comfortable and way more efficient to fly. The Pardey's mantra of "go small but go" or whatever it was is as valid today as ever. I believe a Hurley 20 has been known to go upwind in a F9 and make progress and a Kingfisher 20 bilge keeler in a F8, but with a lot more leeway. The Hurley has a 55% ballast, not sure of the Kingfisher but i think it was around 40%, not many new production boats of that size carry that kind of ballast. Here's someone that build one, plenty of photos. Apparently there are junk and pilot house versions too. Perhaps smaller than most boat recommended, but also an easier to handle project. It is a little outside the parameters of the OP but I'd still consider Haiku. I'd consider a Wharram catamaran myself! Agreed. By way of illustration the smallest boat I've cruised in is my paradox, less than 14'... and yes she definitely has her limit at around 20 knots for windward progress, or less if the seas are nasty, which in this neck of the woods is not much wind. However, given time, conditions change and so she has managed to get me 'there' eventually... takes some care and readiness to get into an anchorage when things start to look grim. She doesn't even begin to compare to something like a folkboat even though a folkboat is still very small. Do you find the Folkboat to have more or less motion in average conditions? I would not consider a multi-hull for an ocean crossing pocket cruiser. I know there have been several...."Cooking Fat" as an example. Cat's and Tri's are not good at carrying weights. The performance suffers significantly with each pound or kilogram you add. The enclosed accommodation is very limited, and getting out of the weather might be difficult whether you are trying to get some relief from the tropical sun or shelter from a mid/high latitude gale. I would consider a catamaran in larger sizes say 30+ feet. We can all see how many cruising cats are out there in the 40 to 60 foot range. I think I'd be mainly looking for boat in this size that are noticeably a bit stiffer than is normal. I think this is an important element of seaworthiness, and am willing to accept the more vigorous motion you will occasionally encounter. I have cruised extensively on a couple of sailboats that were a little on the tender side. We made out just fine. The relative tenderness was mostly frustrating when sailing on a stiff day reefed when others were under full sail. We were able to work to windward in 40 knots gusting...offshore wind in a 20 foot boat under storm main and working jib, but I am less sure we could have done that in a large sea. This is the thing. Do you have the power to work into a large sea? I currently sail a stiff boat. Stiff to the point of being annoying at times ( light or no wind in rough sea). Generally with wind to lean against she is very steady and easy riding. Again I have worked to windward in 40 gusting knots of wind and a rough 2.5 metre sea, with no more stress than if there was 20 knots of wind. The well reefed sails gave ample power to keep the boat moving as fast as I might want. We were able to cook a hot dinner. I have had similar experiences on my Fathers Herreshoff 21 foot Cat Yawl, crossing Georgia Strait close reaching in winds of 25 to 30 knots. With a smaller boat such as being discussed here, I'd choose a stiffer boat over a more tender boat. Last edited by gilberj; 04-09-2019 at 11:33 AM. Atkin Eric built to 36ft. WRC cold molded on Iroko. Beta engine in. Lead ballast in. Deck on. Spars and windlass. Interior done and it floats. I guess the professional builder ran out of lifetime. Built 2011. Just needs refinishing with paint and some sails. Offers on 12k. 12 tons. 6'1" headroom. That's alot of double ended boat if you want a woodie. Just needs someone to love her. In Scotland. Last edited by Edward Pearson; 04-09-2019 at 11:37 AM. I invented a new word in a bar in Antigua the other night. Each time I mention it , it gets a laugh. Gonna use it Wiz. Ill give you the credit. More or less than what?